My old delta coping sled bit the dust. To give it it’s due it saw industrial duty… I am proud of it, but ultimately it had problems and it shouldn’t have failed the way it did. So i have a new one.. and I like it. It is an Infinity cutting tools cop-100 with optional miter bar. I have put this through it’s paces so here we go. #1 Fit, finish, quality. 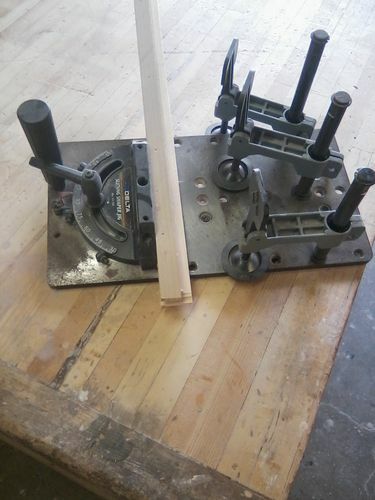 I found this jig to be sturdy, good quality materials, and a smart design. Assembly was easy and the sled came out dead square with out any adjustment. (dead square means under .001 digital.) I like the shield, The clamps feel robust and operate and adjust easily. The best thing is they open well out of the way, making removing and replacing rails a breeze. 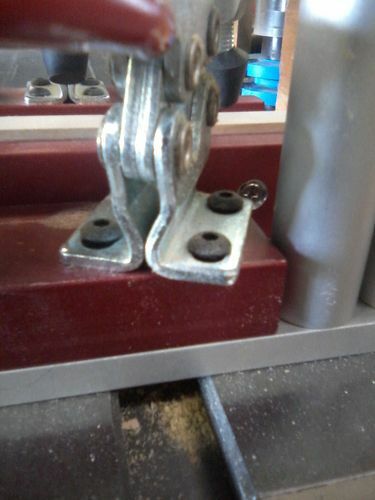 The clamps on my delta were very annoying to use when coping 30 doors… always in the way. (see pic below) Also all the parts and materials are common, and should be easy to replace if they do fail. I will compare the delta again, the pull/turn bolts stripped, and are a special order. Way too complicated of a design when put next to the infinity. Easy quick adjustment. To fit wider materials in the past I had to reposition screw in posts, this one just slides into place. I also like the non skid surface. It adds a secure feeling. I was skeptical about this at first, but I just did a full run of alder, and didn’t notice any surface marks from the sand paper like surface. I also like the lock on the miter bar. This is safer and also handy on the small jet shaper I keep set up for coping. I can pull it back partially off the table without it flipping off the table. Cons: No miter fence, only square. This IS a coping sled, and I have another for angled operations.. but the delta could be mitered. The foam handle is comfy, but I bet it lasts less than a year in my professional operation. No screw slots for adding a sacrificial backer. I had to modify the fence (see pics) to add the maple backers I use to control blow out, but it is aluminum, so easy to do, however there is not good access to the screws. Lastly, the miter slot bar was an extra I had to pay more for. The jig is setup to be able to use the clear lexan shield against the fence, and works well this way, I prefer the miter bar in miter slot for a myriad of reasons. Even though I had to pay extra it is high quality, including steel ball bearing tensioners to keep it tight in the slot, and it went on dead square with the fence. All in all…. 4 stars. lost star because of fence modification. May add a half star in a year after I find out just how it stands up in a professional shop..
look close for the screw mod. I replaced the same exact Delta (it weighs a ton) with the COP100 from Infinity, as well. I have the model with the replaceable HDPE blocks, not aluminium. Makes coping operations just that much safer. I love mine. Have had it for 6 years now. So, anything to add to this review after a year of use? So far the overall construction has held up. It is in operation now, and tough enough to stand up to a commercial operation. The down sides are the same. 1: is difficult to change out my sacrificial backing fences. 2. The grit comes off the non-skid base and scratches the table of my shaper. Other than that it has coped the joints on approx. 1000 + cabinet doors over the last year.